Lego Batman 2 was on sale recently, so I picked it up. In brief: the main story is fun and very cute; the open world bit is only half cooked. Where should I stand to press G? 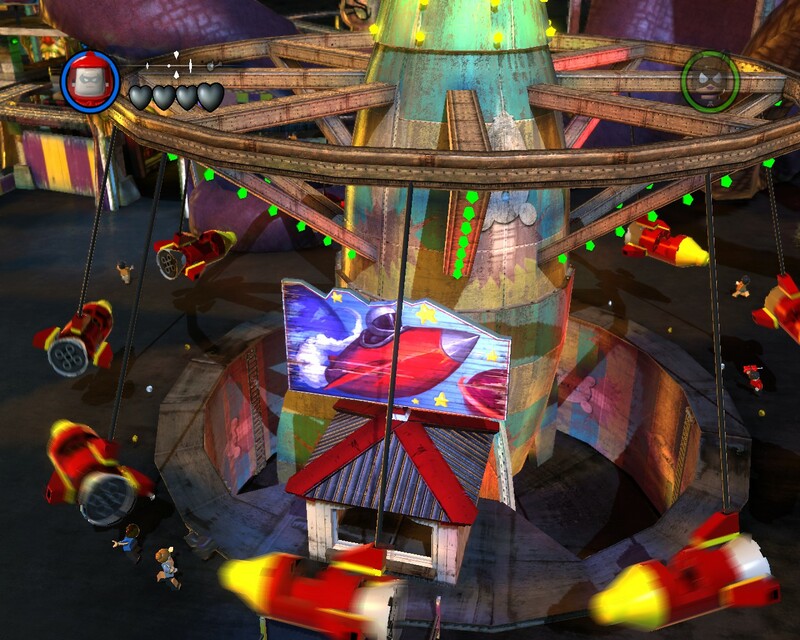 A level basically consists of a series of obstacles, to be solved by the characters’ special abilities. E.g. you might use Batman’s batarangs to destroy something out of reach, or Robin’s acrobatics to climb, or Superman’s super-breath to turn water into ice (which can be traversed). It looks like it’s optimized for two-player co-op, but it’s quite easy to play solo– there’s a key press to switch characters. At first you only get Batman and Robin, but later you get Superman and then a whole slew of heroes. The puzzles are designed so that you have to switch frequently. Sometimes when you destroy something, they can rebuild the Lego pieces into something else. Often this is a suit dispenser: jump on it and Batman or Robin changes into a different outfit with new powers. 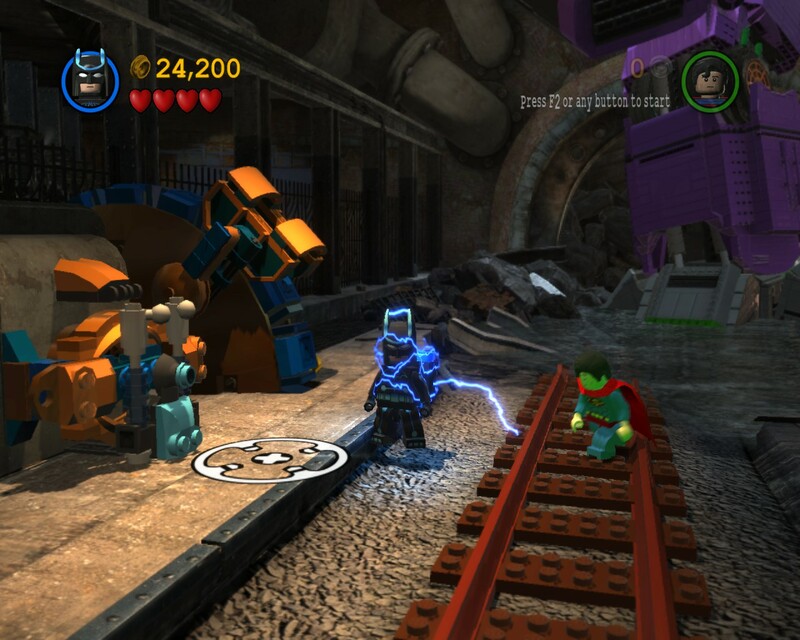 In the screenshot, Bats is wearing his Electrical Suit, which lets him walk through electrified areas and power devices up or down. The story levels are a lot of fun. The designers have worked hard to make the game look and act like a set of toys: the characters waddle around cutely, they look pleased as punch when they change suits, when a character dies it shatters into blocks, and you are encouraged to mindlessly destroy things. If you die yourself, you respawn right there, so it’s never a real setback. Most of the time it’s fairly clear what to do; I am not very good at the sort of thinking required and had to consult a walkthrough. The game was evidently designed for consoles, so it comes with a pretty horrible set of controls– all keys, no mouse. I had to remap just about everything to have it make sense. (I recommend using the arrow keys for movement, using space for jump and E for action as in sanely designed games, then using T for tag and G for ‘special’. Then you move with the right hand and do stuff with the left.) There aren’t many controls, and most are explained in-game, but they neglected to tell you how to punch things (it’s Action, the one I remapped to E). After the Asylum mission you can wander Gotham City as you like. The walkthrough suggested that you wait till the story mode is over before doing so, as there’s a lot you can’t do till you’ve unlocked all the basic heroes. This is bad advice, because the story missions are the best part, and you shouldn’t rush through them. In any case, the main mission took me about 15 hours. After this you can roam Gotham and pick up new characters. This part of the game is frankly disappointing. For one thing, you have to buy each character– not with real money, but with the studs you’ve collected by destroying Lego objects. This was a strange design decision, because it’s easy to run out of studs, so you can’t collect more heroes till you go on a rampage. And busting up objects, in the quantities needed to collect 50 characters, is not that fun. There’s a lot to do– climb buildings as Robin, rescue citizens, drive or boat around. But it feels like you have to run a round quite a bit to find these diversions. Finding the unlockable characters sounds like it should be a great time– each one is slightly different– but for the most part the fights are too easy and the payoff is low. (One exception is Lex Luthor, who you want for his special gun that destroys black Lego objects, which no other character can do.) Plus if you defeat them and you don’t have enough studs, you’re out of luck, which is a strange punishment for the game to apply. So, it’s fun to run around for awhile changing characters, but actually unlocking everyone and finding all the collectibles doesn’t seem very attractive. I think they would have done a lot better to have fewer characters, but more challenging mini-levels to get through to unlock them. Or have more character-specific things to do, like the Robin acrobatics diversions. Story mode has a story, by the way. It’s pretty good, as Batman stories go. Probably the best thing about it is the interaction between grumpy Batman and cocky jocky Superman. It lightly pokes fun at their relationship, and yet it actually creates a character arc for the game, which is more than you might expect in a kids’ version of DC.